Long after the sun goes down in Tokyo there is much to photograph. The city’s neon forests are amongst my favorite in the world. These photographs have appeared in magazines, advertisements, brochures and books. Which cities of the world do you enjoy seeing at night as much as day? 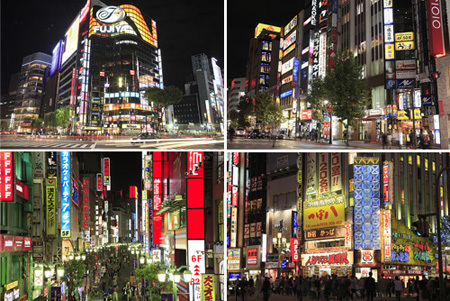 Photographs: Top two (from left) Sukiyabashi crossing in Ginza and Shibuya. Bottom two: Shinjuku. Thanks Catherine. London has a lot of atmosphere at night. The pix didn't show up, it may be a glitch. I'm with Catherine, I like London at night as well and the Chicago skyline at night is gorgeous. Nice pictures - Tokyo is one city I have always wanted to visit and your pictures confirm why. But of the places I have been, Chicago at night gets my vote. Flygirl and John--I must get to Chicago. I think it has the best architecture of all American cities. Tokyo looks truly looks like an amazing city to photograph, I could easily spend a whole night wandering around taking hundreds of picture in a place like that. London is indeed a city that truly comes alive at night, especially central London. You have the combination of the historic old buildings and the modern monstrosities side by side and of course you also have the River Thames. Does it get any better than London, I think not! These are dazzling shots, Wendy, and they make me want to return to Japan, where I lived for three years, a couple of decades back. I was in the Kobe Osaka area then, but it was the very areas of Tokyo that you show here that were my favourites at night. Sydney, down near the Opera House and Harbour Bridge at night is really magical, too. William, I'm a huge fan of London and had the good fortune to live there for a year. I miss it. Andrew, Thank you. I have wanted to see Sydney for a long time. One of these days.